At what age are children first able to tell stories with interesting characters and plot? Does their storytelling have anything to do with their abilities of theory of mind (perspective taking)? And how aware are they of issues of communication to a reader or listener to their stories? These were among the questions that Julie Comay asked in her 2008 PhD thesis. Comay has for some time been a teacher of the younger children at the Institute of Child Study Laboratory School, University of Toronto. She had noticed as a teacher that children who were engaged story-tellers were also very engaged socially. She was interviewed by a colleague at the school, Suzanne Schwenger (2009), to whom she described two children she taught in Grade 2, who were wonderful storytellers. "These two kids were above average in terms of their narrative skills," said Comay. "It also turned out that they were central to the social life of that classroom—the social life revolved about them" (p. 3). For her thesis research, Comay asked 66 children in the laboratory school in Junior Kindergarten (aged around four) Senior Kindergarten, and Grade 1 (aged six and seven) to retell two fables and to dictate two original stories to her. She also took measures of their language skills (sentence repetition and receptive vocabulary), working memory, and performance on two theory of mind tasks. Comay found a significant development with age. The stories of the four-year-olds tended to be of simple action sequences, while those of the six- and seven-year-olds integrated both character and audience perspectives, and started to show complex plots. In terms of individual differences, each child's ability to represent perspective was consistent across the four stories he or she told. Children's ability to accommodate to an audience was significantly related to the tendency to portray inner worlds of characters. To measure narrative perspective-taking in the stories children told, Comay assessed representation of character perspective within the story, representation of the communicative needs of an audience, and representation of the narrative text as an autonomous product. She found that, after controlling for age, working memory, and language skills, abilities of theory of mind made a significant and independent contribution to all three of these aspects of narrative perspective-taking. In her interview with Schwenger, Comay said: "Over and above vocabulary, it seems that the specific ability to understand perspectives does make a difference to narrative adeptness. These [more adept] children are tuned in to other people and are more aware of others" (p. 3). In another project, jointly with Mary Thelander, Comay's findings are being used in teaching children from Senior Kindergarten to Grade 2 in a school in which most children do not have English as their first language. Teachers of these children have been asked to read, in class, stories that are rich in structure and language, and to encourage children in oral story-telling. "The leaps in vocabulary and social understanding are quite amazing," said Comay (Schwenger, p. 5). Julie Comay (2008). Individual differences in narrative perspective-taking and theory of mind. PhD Thesis, University of Toronto. Suzanne Schwenger (2009). Getting perspective: How storytelling reveals and influences children's social awareness. Alumni Echo: Institute of Child Study Alumni Association Newsletter, Issue 8, Spring. 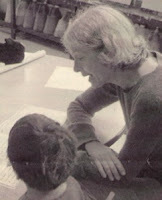 Photograph of Dr Julie Comay with a student at the Institute of Child Study School. Maybe this research will make educators reconsider the approaches to children's storytelling in the classroom. Thank you very much, Cora, for this comment. I think the link that Julie Comay has found between theory of mind skills and story-telling is very interesting. Generally, performance in theory of mind tasks has been found to affect measures of social abilities in children, but it has more difficult to establish effects in the opposite direction; that is to say strong effects of social engagement on children's theory of mind have been hard to find. So if Comay and Thelander do find effects of encouraging story-telling in children, that would be very encouraging.